Meanwhile, Public Expenditure and Reform Minister Brendan Howlin has pledged to repeal the law on emergency public sector pay cuts. 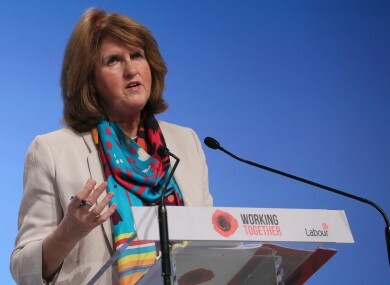 Joan Burton speaking at the Labour conference. LABOUR HAS YET to offer a “reliable remedy” to workers and families who face “unprecedented threats to their living standards” the Minister for Social Protection Joan Burton has said. Speaking at the Labour conference in Killarney this morning, Burton admitted that her party needed to do more and rejected what she said is the “the conservative consensus is that low labour costs are the key to growth and job creation”. She was speaking on a motion that called for the gradual introduction of the living wage, a policy that Burton has been strongly advocating in recent weeks. “Workers and their families face unprecedented threats to their living standards and we as social democrats have yet to offer them a reliable remedy,” she told delegates 1,000 days after party members endorsed coalition with Fine Gael. She said that recovery will “come from the middle out, not the top down” as she outlined the strategy that Labour will be pursuing in the weeks and months ahead. “It is the earnings of the middle and working classes that have always fuelled economic expansion here – and growth in their wages will be central to real and lasting recovery,” she said. Earlier, Public Expenditure and Reform Minister Brendan Howlin pledged to repeal the Financial Emergency Measures in the Public Interest Act (FEMPI) when “the emergency is over”. This law allows him to unilaterally cut public sector pay in some sectors in the event that unions do not agree to the Haddington Road Agreement. Conference has heard a motion calling for its repeal this morning and Howlin said he was happy to support the motion and repeal the legislation once the economy improves. Email “Joan Burton admits Labour's failures on living standards ”. Feedback on “Joan Burton admits Labour's failures on living standards ”.